On Friday March 7th, Sugar House’s Chroma Gallery opened a new exhibit featuring the work of many talented Utah artists, including Salt Lake’s Jennifer Worsley . In their front gallery, Chroma has introduced a couple of new names, including abstract painter Linnie Brown, from Lehi, and sculptor Colby Brewer from Provo. In their rear gallery Chroma has staged the first substantial exhibition of Salt Lake City artist Jennifer Worsley. Worsley was raised in Salt Lake and has been living here for a few years after having studied art on the east coast. 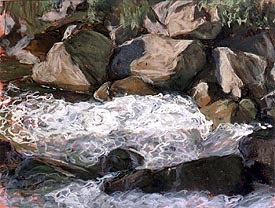 Chroma’s exhibit of her work entitled River Paintings features three oil paintings and over fifteen pastels all showing scenes of rocks and running rivers. The works are displayed together in one room, allowing the repetition of the images to play on the viewer’s consciousness. Worsley’s touch is light and her attention to detail subtle and alluring. The interplay of light and shadow created by tree filtered sunlight on the rocks and river is so subtle that one must remain with the works for a time before it becomes fully evident which portions are lit and which are not. Worsley’s astute eye has found a seemingly endless source of material in one simple spot, overlooked by many artists who travel many miles south or into the canyons to discover their material. All the works come from painting sessions Worsley has done over the past two years in Sugarhouse Park, a location she says gives her a unique opportunity to study light on the rocks and water because the stream does not run inside a deep gorge and runs a generally east-west direction. In the rushing water of this city stream she reveals a complete palette of colors — mauves and greens in the deep pools, vibrant blues and whites racing across the surface of the water, and a range of umbers and oranges in the rocks. And beneath this mad scratching of hues is the warm red/pink tones of the paper Worsley prepares herself and allows to peak through in many sections. The three paintings in this exhibit are a sort of return for Worsley. She had spent much of her art education (in New York and Boston) working with oils, while studying the figure. Her interest in landscape led her to work in the transportable medium of pastel, for which she is most well-known in Utah. For this exhibit, however, Worsley decided to return to oils, developing some of her smaller pastel studies into larger oils. I think, however, that the pastels remain her strongest work. For such a young hand she already seems a master of her medium. 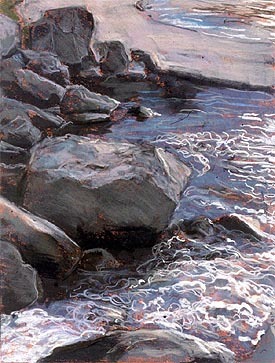 The variety of her pastel techniques makes the works flow between drawing and painting, utilizing the full effect of the medium. The pastel may be brushed in in large smooth areas, or scraped across on a fine point to accentuate the roll of the water. The paintings do not seem as confident, the surfaces are not as well worked and the subtle traces which are so alluring in the pastels seems to be lacking. The smaller size of the pastels also seems to be more appropriate to the intimate selections she is making. Grouped together, the individual works become one larger work. The repetition of the same motif risks overcrowding the viewer, but manages, instead, to force the viewer to take the individually cropped scenes more seriously. The viewer is invited to see the differences — in light, in color in composition. Worsley asks the viewer to do what she has done, to become intimate with the subject and see its many facets. You can never swim in the same river twice and Worsley won’t let you. She shows you first this scene, then another. First this light, then another. Like Monet’s many series, Worsley shows one that light is the subject, and one which changes from season to season and from hour to hour. 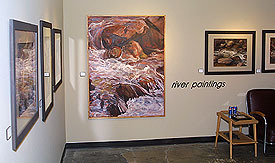 “River Paintings” will be on display at Chroma through April 7th. Upcoming exhibitions for Worsley include participation in the Utah Arts Festival and a group show at the Horne Fine Art gallery.